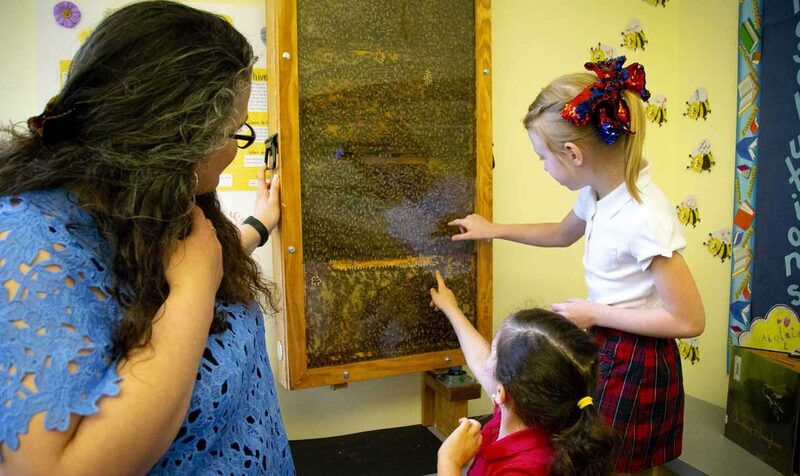 PORTLAND, Ore. (CNS) — It’s not unusual for kindergartners to fear bees, but the little ones at St. John Fisher School in Portland flock to a buzzing hive in their school’s library to get a close look at the flying creatures with stingers. One by one, the uniform-clad Catholic school young’uns climb up on a chair and press their hands on the plexiglass window that separates them from thousands of honeybees that are busy creating a honeycomb. “It’s hot,” said one girl whose blond ringlets swayed as she turned to face Sundi Pierce, the school’s librarian and custodian of the observational beehive, on a Thursday morning in late May. Earlier this year, St. John Fisher became the first Catholic school in Oregon to partner with The Bee Cause Project, an organization that has helped provide 300 educational facilities in 50 states and four countries with observational hives that also deliver an ecological need. Ecologists have been concerned about the decreasing population of honeybees for at least a decade and a 2017 U.S. Department of Agriculture report showed a 40 percent decrease in colonies from 2015 to 2016, caused by Colony Collapse Disorder, a sudden loss of a colony’s worker bee population. Continued loss of honeybee populations would be disastrous for the world’s ecosystem, scientists have warned. The 3,000-plus buzzing bees are more than a novelty at St. John Fisher. They serve as a learning tool for subjects in science and religion, said Merrit Holub, the school’s principal. The science part is obvious, because students can see directly how the bees reproduce, contribute to the food supply by transferring pollination, and make honey and beeswax. But the bees also represents religious symbols, Holub told Catholic News Service. For instance, the Catholic Church views the honeybee as a model for “Our Lady,” because of its good working habits. St. Augustus encouraged monks to use the caste worker bee as a model for their vow of chastity, and beekeeping has been a centuries-long tradition in religious orders, providing the community with wax for chapel candles and honey for industry. Even Bishop James D. Conley of Lincoln, Nebraska, is a noted beekeeper, an interest he has fostered since his college days. “St. Valentine is the patron saint of (beekeepers), so we kicked off our observation hive study on Valentine’s Day,” Holub said. The bees were donated to the school by Costa Oro International, a Portland coffee bean distributor. The connection to the school comes through one of its employees, Arianna Hartstrom, who is a parent of students at St. John Fisher. The fear of bees has definitely waned among the St. John Fisher student body, said Marian Dolan, the parent of children who attend the school. The Bee Cause Project is trying to engage the younger generation in its mission to save bees and secure the ecosystem. The honeybee colony at St. John Fisher resembles observational hives installed at other schools. The hive is contained in a wood and plexiglass box and the pollinating bees fly out of the building through a hole in the building behind the library wall and return later with nectar, Holub said. Because the hive has generated so much excitement among the St. John Fisher students, the school library is suddenly a very popular spot in the school, which thrills librarian Pierce.